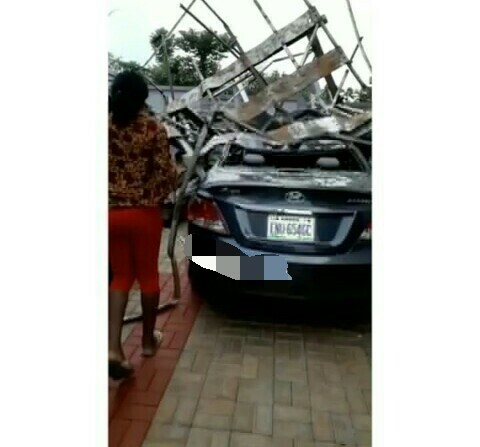 According to a video posted on instagram earlier today, a student of the University of Nsukka, Enugu woke up this morning to find her newly purchased car badly crushed by a tank stand that fell from the roof of the 4-storey building she resides in. The tank stand had fallen earlier this morning and while it was falling, some of its remnants also destroyed some rooms in the building as some things off the tank stand found their way in, through the window. The girl can be seen in the video, looking distraught and helpless as she surveils the scene in disbelief.